I mentioned a few weeks ago that I am one of those people that struggles with the dreaded falling pants syndrome. I often feel like I spend half my day hiking my pants up! So, I few years ago I came up with this little trick that keeps me from going crazy all day long. Of course I could have all my pants altered BUT I have a lot of pants and I just couldn’t be bothered with the time and money it would cost me. All I do is use a hair elastic to loop through a belt loop and attach it to the button. (just as a sidenote: I would use an elastic that is close in colour to the pants I am wearing but for the purpose of the pictures, I did the opposite. And I only do this with my pants when my top is long enough to cover the elastic). You could also do the reverse of this for a growing belly (ie. if you are preggers or having been eating too many pies!) 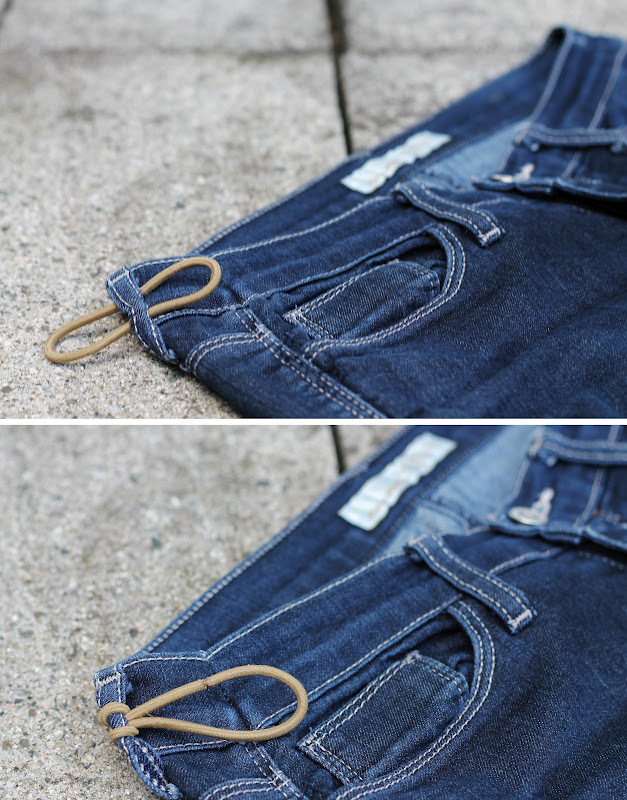 by leaving your top button open and attaching the elastic to the button to hold your pants up! Give it a try with those dreaded falling pants!